MCSN Karolina A. Martinez/Navy Benjamin Walker, who plays Lincoln in the film ' Abraham Lincoln: Vampire Hunter' tours the bridge of the carrier Abraham Lincoln before showing sailors aboard a sneak peek. Sailors on the aircraft carrier Abraham Lincoln received a visitation from the ship’s long-dead namesake in his new cinematic role as a presidential hunter of the undead. 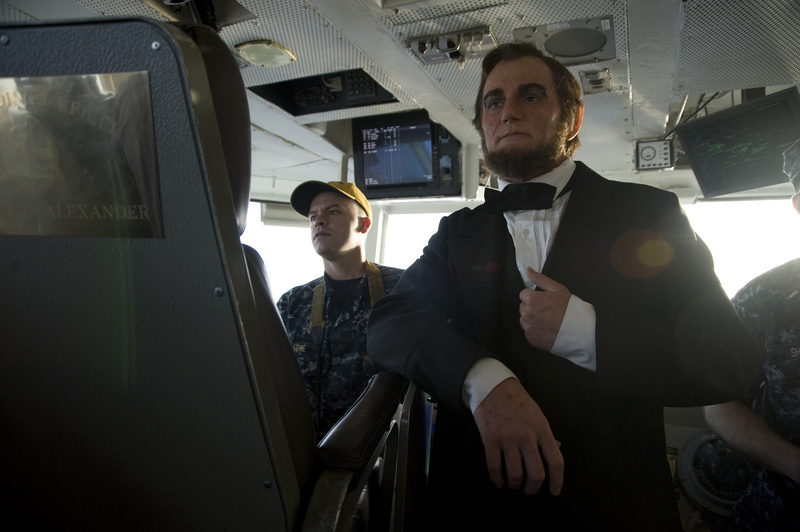 Actor Benjamin Walker, in costume as the 16th president, and some of the cast of “Abraham Lincoln: Vampire Hunter” toured the ship, signed autographs and posed for pictures before treating the crew to a sneak preview of the flick, set to be released June 22 in 3-D. The movie also stars Anthony Mackie and Erin Wasson, who joined Walker on the visit. The action film tells the story of President Lincoln’s fight against the undead after realizing vampires are trying to take over the U.S.
“For whatever else I am — a husband, a lawyer, a president — I shall always think of myself first and foremost as a hunter,” Lincoln says in the trailer. The movie was screened in the hangar bay of the carrier, which is deployed to the Arabian Sea. Sailors cheered both at the beginning and as the final credits rolled, according to a Navy press release. According to a poll on movie review site Rotten Tomatoes.com, 85 percent of moviegoers want to see the action film. After the movie ended, the actors joined on board, as well as Seth Grahame-Smith, author of both the original novel and screenplay; director Timur Bekmambetov, who also directed the action-adventure film “Wanted”; and producer Jim Lemley to answer answered questions from the crew. One of those films you want to see but really don’t want to admit it and just wait until it gets to the $1 theater or Netflix. The book was fantastic and a fast page turner. Looking forward to the movie, but yes, probably as a rental at a later time.